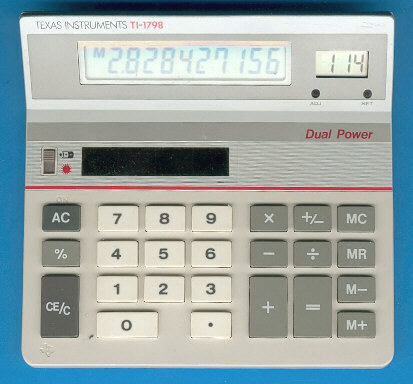 Texas Instruments introduced in the United States with the BA-20 a very useful calculator. Beside the basic calculator functions 6 additional keys enable the COST, SELL, MARGIN calculations. You enter either two of the variables and get instantly the result of the remaining value. Both the housing and the clock module were used with this TI-1798 and its European sibbling TI-610. Please notice the designation on the printed circuit board (PCB), a hint that leads into the search of a TI-1796 calculator still missing in the collection. The next generation of the TI-1798 looks completely different. © Joerg Woerner, April 12, 2005. No reprints without written permission.